Brett Luke | The Journal Gazette The Komets celebrate after their first goal against Wichita in the first period at Memorial Coliseum on Saturday night. Can you believe the Komets have three guys around 30 goals? Desjardins has 29. Garrett Thompson, who had a hat trick, is up to 29, and Shawn Szydlowski has 30. That's incredible for any level. Cody Sol and Justin MacDonald could return to the lineup Wednesday against Kansas City, so that would be big as the Komets are six points back of Toledo with six games remaining. I don't see any way the Walleye gives up that kind of lead, but they did lose to Brampton on Saturday. If you're wondering about the fracas as the game at Indianapolis ended Friday, I'm not expecting any sort of suspension to come down for either team. Maybe a fine for an Indy player. 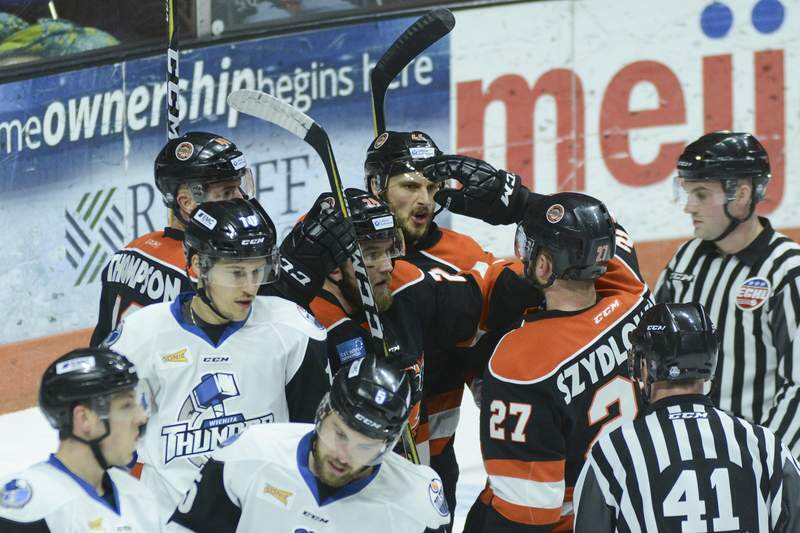 The Komets went 4-0-0 against Wichita during the regular season.